Jafnea semitosta is not often treated in field guides, but is probably fairly common in eastern North America. 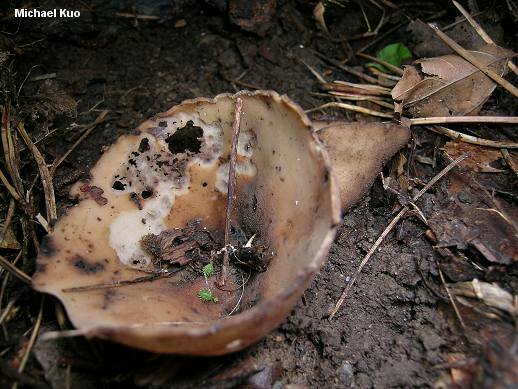 It is a fairly large cup fungus with a pale upper surface and an outer surface covered with fine brown hairs--rather like an overgrown version of the better known Humaria hemisphaerica. 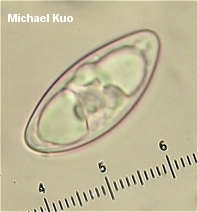 Jafnea fusicarpa is similar but smaller, and might be confused with Humaria hemisphaerica, but the latter species is more densely hairy and appears brown overall, while Jafnea species are more sparsely hairy, appearing pale (spore sizes will also help to separate these species; see the key to cup fungi). Paxina semitosta Seaver is a previous name, as is (reported without comment) Fuckelina semitosta Kuntze. 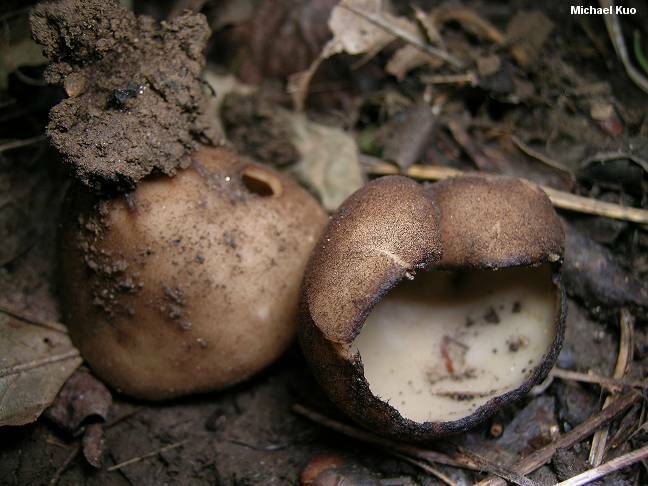 Ecology: Officially saprobic, but potentially mycorrhizal (in my view) like many members of the Pezizales; growing gregariously on the ground or from well-decayed wood; when terrestrial usually found near rotting wood, in lignin-rich soil; fond of conifer forests, but appearing under hardwoods as well; summer and fall; east of the Great Plains. 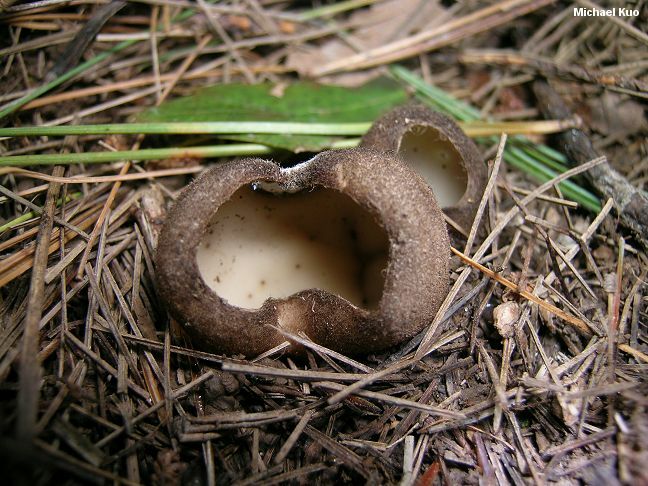 Fruiting Body: Deeply cup-shaped when young and usually retaining a cuplike shape into maturity; 1.5-7 cm across; upper surface bald and whitish, darkening to brownish with age; outer surface finely and sparsely hairy with brown hairs, pale brownish underneath the hairs; pseudo-stem usually present (but often buried), with a ribbed surface, up to 2 x 2 cm; flesh pale and brittle. Microscopic Features: Spores 25-35 x 10-12 µ; fusoid-ellipsoid; smooth in KOH, but warted in Melzer's reagent. Asci eight-spored; tips not bluing in Melzer's reagent. 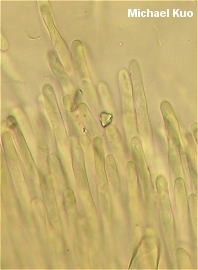 Paraphyses cylindric with rounded apices; yellowish in KOH; 2.5-7.5 µ wide. 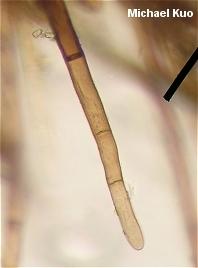 Hairs brown in KOH; septate; asperulate; up to 12.5 µ wide; apices rounded. REFERENCES: (Berkeley & Curtis) Korf, 1960. (Saccardo, 1889; Seaver, 1928; Korf, 1960; McKnight & McKnight, 1987; McNeil, 2006; Kuo & Methven, 2010.) Herb. Kuo 09220604, 09240803. Kuo, M. (2012, July). Jafnea semitosta. Retrieved from the MushroomExpert.Com Web site: http://www.mushroomexpert.com/jafnea_semitosta.html.